Do you suffer from insomnia? Ever have trouble falling asleep? Or maybe you drop off instantly because you’re so tired, only to wake up a few hours later? And then you’re wide awake and unable to fall back asleep. If this sounds like you, then you may have an energetic imbalance in your body that is causing the insomnia. Fortunately, it is possible to bring your body back into balance. 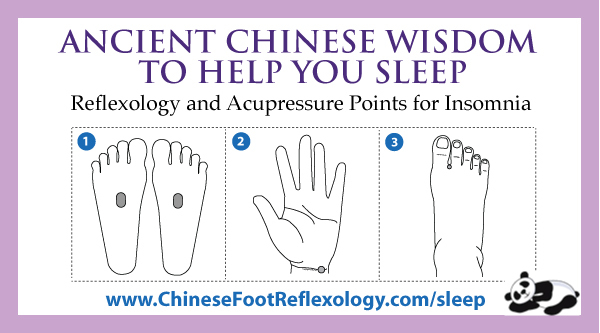 Discover how massaging reflexology and acupressure points can help you get a good night’s sleep. Chinese Medicine: What Causes Insomnia? First, let’s go over the root cause of insomnia—specifically, what’s out of balance in your body? When you understand the root of this disorder, then you can take a multi-pronged approach to fix it. In Chinese Medicine, the Heart and the Mind have a symbiotic relationship. If you’ve ever seen a yin yang symbol, you can compare the Heart and Mind relationship to the relationship between yin and yang. And if you’re not familiar with a yin yang or if you’ve simply forgotten what it means, here’s a quick explanation. As you can see in this diagram, a yin yang looks like two fish swimming together in a circle. The white fish is the Yang element, and the black is the yin element. 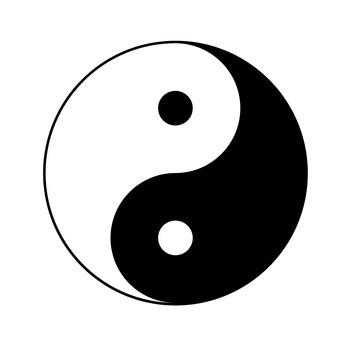 In Chinese philosophy, it is said that yin and yang are mutually dependent, meaning that they depend on each other. In order for one to exist, the other must exist. The same is true for the Heart and Mind. They are not separate parts of the body functioning independently of each other. Instead, they need each other to survive. The health of one influences the health of the other. In the case of insomnia, the Heart plays a very important role. It acts as an anchor to the Mind. When you are thinking and worrying at night, the qi in your body (your life force energy) goes to where the action is—and that’s up to your head where all the thinking is going on. It’s like when you lift weights and the blood flows to your muscles. Well, when you think too much—during the day and night—your qi tends to congregate in your head. When there is too much qi in your head, it’s a sign that your body is out of balance. Normally, when the Heart organ and energy meridian is strong, it acts as a counterbalance to the qi floating up to your head. However, if the Heart is weak, then the qi has free reign to float upwards and the excess qi in your head disturbs your sleep. It can also cause you to worry and overthink even more, feeding a perpetual cycle of too much qi in your head disturbing your sleep. I know because I used to suffer from insomnia. When I was working in high tech many years ago, I was under a lot of pressure. In addition, I worked as an Information Architect and Interaction Designer. This was a very specialized role where basically I created blueprints for entire websites. I was the person who figured out how a visitor would go through a site, screen-by-screen and click-by-click. Every interaction on the website had to be mapped out and documented in advance, right down to what would happen if User A entered an alphanumeric character for the zip code box when they should have entered a number instead. Yep, I kept a lot of data in my head at all times. Working in the high-stress, high tech industry for years—in a very mind-centric role—eventually pulled my body out of balance and depleted my life force energy. And forget about the harmony between my Heart and Mind! I was in complete denial of my Heart and leaned heavily on my Mind to run my life. As a result, I had a weak Heart from a Traditional Chinese Medicine (TCM) perspective. This is different from the Western perspective of having heart disease, but equally serious in Chinese Medicine. Coupled with the demands of my job, I was a classic TCM case study for insomnia. I’d go to bed around midnight—falling asleep quite easily—only to wake up at 3 or 4 in the morning and struggle for hours to fall back asleep. Fortunately, I made a number of life changes (you can read about them here) that led to restoring balance in my body and also honouring the relationship between my Heart and Mind. If you had met me 10 years ago, you would be completely surprised at how different I was from how I am today. I share my story to inspire people to make changes in their lives and to show it is possible. It doesn’t matter where you’re starting from because. You. Can. Beat. This. You can get a good night’s sleep every night(you can read about them here)and you deserve it. For a long-term solution to resolve the root imbalances causing insomnia, you need to strengthen your Heart and restore balance between your Heart and Mind. However, if it’s 2am right now and you can’t sleep, what matters right now is, how do you get the @#%! back to sleep? The key is to draw the qi out of your head and back down into your body. Do this now, and focus later on strengthening your Heart—and there are Chinese Reflexology points to help restore balance. However for right now, you’ll want to massage your feet to draw the qi down from your head. In addition, there are some really powerful acupressure points that can help calm your mind. This point is close to Kidney-1, a powerful acupuncture point for drawing excess qi down from the head. The excess qi is what’s keeping you up at night so when you massage this point, it helps to clear the excess energy out of your head, which helps to soothe your mind. The Kidney reflexology point is also good for recharging your energy stores—think of it like a cell phone battery, but for your body. Your energy levels are probably quite low due to the lack of sleep. As I could write a whole article on the Kidney point (and I have in my free online mini lessons), it is a bit more than necessary for this article. After all, you want to get to sleep. So, here’s a fast and easy way to get a “good enough” massage of the point to help you fall asleep. 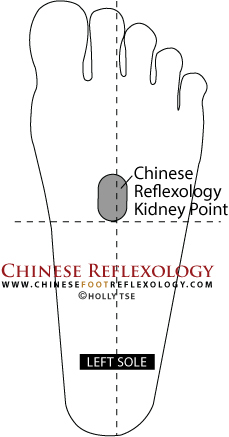 When you’re more rested, I’d highly recommend learning more about the Kidney point because it is the most important point in this system of Chinese Reflexology, and it’s the point that can make the biggest difference for your health and longevity. You can learn more by signing up for my monthly newsletter. 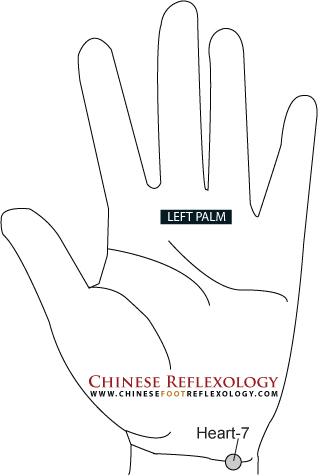 When you sign up, you’ll get free reflexology charts, and also receive a series of online lessons that show you how to use Chinese Reflexology to uncover energy imbalances in your body. And Lesson 3 in the lessons is all about the Kidney point. The Kidney reflexology point is located on the soles of your feet. To quickly find this point, imagine a vertical line dividing your foot in half. Then imagine a horizontal line dividing your foot in half (from the tip of your big toe to the base of your heel). This forms four quadrants, and your Kidney point is located in the top inside quadrant of the foot. Place your thumb on the imaginary vertical line so that the tip of your thumb is just below the ball of your foot. Then press in with your thumb pad and massage on this area, with a small circular motion for about five seconds. Then move your thumb down (towards the heel) by a few millimeters or a sixteenth of an inch, and repeat. Keep massaging until you reach the imaginary horizontal line dividing your foot in half. In total, it might take about 30 seconds to massage the entire Kidney point. When you’re done, repeat on the other foot. You can massage the Kidney point for 30 to 60 seconds per foot. It’s very likely that the point will feel quite sensitive when you press on it. The sensitivity is an indication of the energy disharmony in your Kidney meridian, as well as the depletion of your life force energy stored in the Kidneys from the lack of sleep. The Heart-7 acupressure point is very powerful for calming the mind. In fact, it’s Chinese name, Shenmen, means Spirit Gate. This point is frequently used in acupuncture to treat insomnia due to emotional issues and/or anxiety. The Heart-7 point is located on a crease on your wrist. Hold your palm facing upwards, and look at your wrist. You’ll notice a pronounced crease in the skin where your hand meets the wrist. Next, notice where the base of your pinky finger and your ring finger meet. Imagine a vertical line from this point going straight down and intersecting with your wrist crease. Press on the crease where the imaginary vertical line intersects it. You should feel a slight indentation on the inside of the tendon in your wrist. This is your Spirit Gate. Press your thumb into the point and hold for about 60 seconds for each wrist. You can also use this point whenever you feel stressed as it can help to calm your spirit and soothe your Heart. If you’ve been feeling agitated, frustrated or angry lately, it’s no wonder you can’t sleep! These emotions really impact the flow of qi (energy) in your Liver meridian. When the Liver meridian is out of balance, it can drive too much qi up to your head, causing you to have trouble falling asleep. To counterbalance this effect, you can press and hold the acupressure point, Liver-2. Liver-2 is located on the top of your foot at the tip of the webbing between your big toe and second toe. To massage this point, press your knuckle into this area right between the toes near the tip of the webbing. Hold for 60 seconds, and then repeat on the other foot. Hopefully, you’ll be yawning by now—and not because my article is boring, but because pressing your points has helped get that excess qi out of your head. Many years ago, when I was getting acupuncture to treat insomnia, my acupuncturist was this old school Chinese Medicine doctor from China. He was a super nice guy and he took the time to share with me a simple exercise to help pull the qi down out of your head. I found the exercise really helpful, so I wanted to share it with you. To start, bring your attention to the top of your head, and then imagine relaxing it. Move your attention one inch lower (or 2.5cm for the metric connoisseurs) and relax this area. Take a deep breath. Then, continue moving your focus down your body one inch at a time, relaxing your head or whichever part of your body is at the one inch level that you’re focusing on. Remember to breathe deeply, too. By the time you get to your shoulders, you may very well be fast asleep. Feel Like a Shower or a Foot Soak? Showering can also help you sleep, so long as it’s not one of those invigorating type of showers. The downward direction of the water can help draw your qi down out of your head. Similarly, soaking your feet in warm water before you go to bed can help pull the qi downwards, too. Dr. Andrew Weil describes this technique really well on his website. Basically you breathe in for 4 seconds, hold the breath for 7 seconds, and then exhale for 8 seconds—and you have to do this while touching your tongue to the roof of your mouth just behind your teeth. This was something I was taught to do in martial arts. Apparently, it completes some sort of energy circuit in the body. Dr. Weil says that this breathing technique helps to “reset” the nervous system. Do this for several breaths, and he recommends no more than 15 seconds the first time you do it, and then to gradually build up to one minute. You may already know this, but the light coming from screens can disturb your body’s natural sleep cycle. While I hope you’ve found the information in this article helpful, it’s time to turn off your computer, shut your tablet, or put down your phone. You can learn more about the Kidney point and how to use Chinese Reflexology to find energy disharmonies in your body and start bringing your body back into balance. Now seriously, turn off your computer and go get some sleep! Hi Holly. I very much appreciate the information you share with us and have tried to sign up for your e-mails and foot charts, but can’t seem to find the link. Can you point me in the right direction? Thanks Holly! I hope you are able to work on a full seminar… I’m sure it would help a lot of people! Just as a side, an auntie in Oakland is an acupuncturist from Nanjing, and she always needled the following spleen point for my sleep issues… do you recommend it as well? You’re welcome! Spleen 1 is to help with worry. Perhaps she thought you worried too much and that was what was causing sleep issues. Thank you so much for your wonderful monthly updates Holly. I am holistic therapist and have used your tips to help me with my own practice. Where acupuncture was a little too strong for a client suffering with debilitating migraines, the advise you gave on reflexology for migraines was really great and I feel a gentler alternative for a man that was almost driven to suiside. Thank you! As she is going through initial tests st the moment, I am praying we have found this early enough!! Thank you for your wonderful webpages Holly. I look forward to them every month and can’t wait to buy your book soon! Good luck ! Sue Moodie ?? What an amazing story! Thank you for sharing. It’s always a delight to connect with other reflexologists and healers. I’m so happy to hear that what I teach is reaching so many people and making a difference in people’s lives. Thank YOU for all that you do to help and support others on their journey back to wellness :). What can I do to relieve night sweats? Thank you for your question. Night sweats are not something that can be answered quickly. I will add this topic to my list of future articles and workshops. Holly, thank you so much for your warm, honest, down to earth manner. I feel as though a good friend has been sending the newsletters. Thanks to your advice for getting over a cold quickly, I got rid of one incredibly fast following your directions. Encouraged by this success, I will continue to work on other areas of health. I wish you continued success in your quest to help others, and I congratulate you on the publication of your book. Thank you so much, Holly, for the wonderful and systematic presentation for the benefits of the people suffering from various disorders. You are really concerned for the wel-being of others.Almighty God will certainly help you in all your endeavours, as you have been doing HIS work. So kind and NICE of you. Hi Holly. I just finished reading your book Sole Guidance on my Kindle and since I wanted to mark a lot of places and it’s easier to do it in a book, I went ahead and bought a copy of your book also. It is fascinating! I have learned so much and I am putting it to use. I am finding that what I am doing so far is really giving me results. Thank you so much for your hard work and your great book and your sharing it with so many. I Holly. I am reading your book Sole Guidance and am now ready to start your core routines. I love the book and your teaching style. I was looking for one specific bit of information in the book but don’t find any mention of it. I had Non-Hodgkin’s Lymphoma in 2010 which manifested as a tumor in my spleen. I had a splenectomy at that time but am fine now. Should I even massage the spleen point at all? Yes, it’s pretty cool how LV-2 is used to treat sore throats and the throat point is the same.